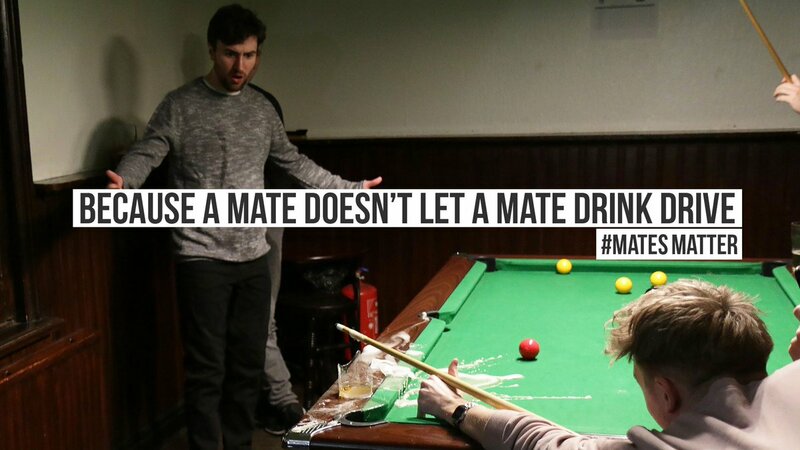 “A mate doesn’t let a mate drink drive”: What’s wrong with this campaign? Our campaign is calling on friends to do what they do best – look out for each other. We’re specifically calling for mates not to let their mates drink drive, asking them to step in when necessary when a friend who is driving is drinking. In Great Britain, in 2015, there were 170 young people between the ages of 17 and 24 who were killed or seriously injured in reported accidents when over the legal alcohol limit. The video shows a group of friends preventing their designated driver from drinking alcohol at the pub. The driver wants to have one pint, but his friends deliberately continue to spill his drinks – before buying him a non-alcoholic drink. At the end, the group ‘cheers’ each other with the caption ‘knock it on the head’ – in reference to one of the ways they have prevented the driver from drinking. The video, which contains strong language and what might be considered by some as inappropriate behaviour, has been viewed 5.3m times on Facebook. A second campaign video, ‘Party Time’, champions the designated driver, who in this case is Dr Ofori – an opinionated Uber Driver played by Michael Dapaah, an English rapper, actor and comedian. The video, which has been viewed more than 4m times, follows a group of mates on a night out with their Uber driver, who sticks to soft drinks while the others drink alcohol. On the journey home, the driver is forced to brake sharply to avoid a pedestrian on his mobile phone – with the driver highlighting his ‘ninja reflexes’ as a result of not having consumed any alcohol. The overarching 2017 THINK! festive campaign puts forward the premise that ‘a mate doesn’t let another mate drink drive’, and depicts celebrity friendships including Ant and Dec, Barack Obama and Joe Biden, and Rodney and Del Boy. The video signals a move away from the traditional approach taken by the THINK! Campaign, which was outlined by Dawn Lauder, who heads up the marketing team at the DfT, at the National Road Safety Conference 2017. She told delegates that with road safety advertising becoming less noticed, it was time for a new approach to make THINK! more relevant at ‘moments that matter’ to young drivers and their passengers. Essentially the change from previous campaigns is simply a shift towards social media to get the message over to young people, because that is a more appropriate medium to reach them than traditional media. I am more interested in how the problem is defined, and how it fits into perceptions of what “road safety” is about. The THINK! strategy for drink driving is to deter those most at risk — men aged 17 to 34 — from having a second drink. We think it worth noting that “those most at risk” are the drivers who kill themselves, not their potential victims. While some of the official reports refer to the number of people hurt or killed in accidents (sic) where a driver was over the legal limit, much of the reference is to those (as above) killed in incidents when they were over the legal limit. Right from the start there is a blurring of the distinction between those who are judged to be at risk of hurting/killing themselves and hurting/killing other people. At this point we should make the road danger reduction view clear: drink (or drug) driving is wrong because it increases the potential for those in charge of motor vehicles – which is there for all drivers to start off with – to hurt or kill other road users. It is rightly defined as criminal because of this and because it is something which drivers are aware of: it is easy to know that you have been consuming alcohol. Nevertheless, while there is, for example, no measurable indicator for levels of fatigue, a responsible driver will be aware of the fact that they are tired and are not safe to drive. Drink-driving (and drug-driving, to which the same issues apply) is therefore something which should be stigmatised and condemned because it is one – but only one – of the numerous forms of rule and law breaking by those in charge of motor vehicles which increase danger to others. That’s what the problem is. Putting a number on its extent is difficult. For example, it tends to occur at certain times such as evenings and early mornings at weekends rather than a fixed proportion of all driver journeys. It will be more common among certain age groups (hence the focus of the campaign). It gets recorded in some police stops, which are restricted to a very small proportion of driver journeys . Questionnaires suggest that approximately a million drivers drink before driving at any time in the year, but these may be underestimates because of the (justifiable) stigmatisation of drink-driving and associated unwillingness to admit to it. On top of this, it is more than possible that drink-driving is implicated in many of the instances where drivers fail to stop (hit and run). Above all, discussion tends to be restricted to those incidents where death or injury has occurred and police investigate, particularly where death occurs and also where the drink-driver has hurt or killed themselves. So, as a proportion of all the road danger that exists – that is to say danger to road users, which essentially comes from the (mis)use of motor vehicles – it is difficult to say how much comes from drink/drug driving. However, a good rough estimate would seem to be about 10 -15%. In other words the vast majority of road danger – more specifically rule and law breaking by those in charge of motor vehicles – comes from sober drivers. Some years ago an RDRF supporter who worked as a driving instructor (yes, a driving instructor can be a supporter of road danger reduction!) was chatting to me about his pet road danger hates. One of his favourites was drivers who would tell him that they were a “good driver” (aren’t all drivers “good drivers”?) because they didn’t drink and drive. Obviously he wasn’t excusing drink driving: his point was that it was being used as diversion from the vast majority of bad driver behaviours. Sociology, anthropology and cultural studies are full of examples of stigmatised, deviant and outlier behaviours which function to stabilise and validate the mainstream and non-deviant. Our concern here is that drink-driving functions in public consciousness as a means of shifting attention away from most of the endangering behaviour in the road environment. (At this point see the discussion in a wider context in Chapter 12 here :although the data is now 25 years old, the main argument still applies). After all, when we are under the influence of alcohol, we are “not ourselves”. Thus drink-driving is something bad, but in essence not what normal, typical drivers do. But what normal, typical drivers do is what is responsible for the vast majority of rule and law breaking behaviour which endangers others. The one new development in the campaign is the relentless stress on the responsibility, not of the drink driver, but of their friends. It’s all about the “mate”…What does this tell us about how safety on the road is viewed by the government body responsible for “road safety”? 1. The driver as pathetic. Young men are more likely to be inexperienced as drinkers, and inexperienced as drivers. Young men have always been higher-level risk takers. Nevertheless, they are deemed legally old enough both to drive and to drink alcohol. Everybody knows that it is illegal to be in charge of a motor vehicle when under the influence of alcohol. But this is not accepted by the campaign. We are presented with a driver – in at least one case – who is the “designated driver”, selected to be sober when driving his friends. He must know that he is driving a motor vehicle. He must know that the liquid served at the pub or party is alcoholic – it’s why there is a designated driver in the first place. 2. The driver as requiring others to take control. Because of this level of irresponsibility, the drink driver has to be controlled by his mate(s). He is so incapable of making the correct choice on the most basic decision – whether to drive under the influence of alcohol or not – that someone else has to make this choice for him. In this case, the person(s) required to do so will also, somewhat strangely, be a young man under the influence of alcohol. The point is that the driver requires someone else to make the most basic decision for him. Indeed, much of the message of “road safety” over its 100-year history is about assuming that drivers are incompetent. The thrust of engineering has been to make vehicles more crashworthy, and of the highway environment to be easier to drive in and more “forgiving” to rule and law breaking drivers. It is all about assuming that ordinary drivers will be either unable or unwilling to drive properly. This directly contradicts the core of motorist identity – which is that a motorist is someone who is properly in charge. So we have the idea that a driver cannot be criticised for their driving, but that they should be controlled when it comes to breaking a well-known and basic law. 3. 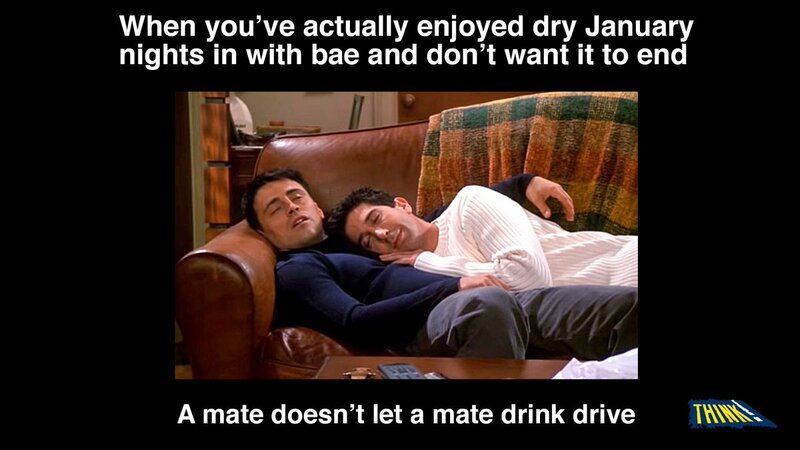 The driver should be controlled by his “mate”. The person endowed with this special responsibility has to be a “mate”. And remember that this appears to be restricted to drink-driving and not, for example, speeding. At this point I should confess to a personal experience. Although this has the limitations of all anecdotes, you may find some resonances with your own experience. Some years ago I (quite mildly) remarked to a man in our group at a pub that he was going to be driven home by his wife, who was just over the legal limit for alcohol consumption, and that this was wrong. This person was a “driving instructor”. “You’re not even a friend of mine!” he shouted. The requirement for a friend to be the agent of control is a key element of car culture and “road safety” mythology: the behaviour of the driver is essentially a personal matter for the driver. As such, intervention is to be carried out by someone who has been selected by the driver, namely their “mate”. My suggestion is that appeals for mates to become involved may not have much success: the persistence in thinking that driving is the personal business of the driver is resistant to intervention. But that’s a secondary point. The main point is the reiteration of the notion that even basic law-breaking is a matter for the motorist to decide upon. This echoes the message we often get in court cases where killer drivers are seen as victims (“s/he will have to live with this for the rest of their life”) rather than perpetrators of an offence. Indeed, the DfT campaign, under the heading “The consequences” refers to potential problems for the convicted drink driver, rather than the effect on other members of society. Obviously it makes sense to direct a potential offender’s attention to adverse consequences for them, as well as the anti-social nature of the offence. The point I am making is that the DfT and “road safety” industry approach is based very much on the notion of driving as being a personal matter which is up to them and possibly a close friend, rather than something which is dangerous law-breaking. This can all be seen in the context of the current uproar from motorist organisations against the suggestion by the UK’s top traffic police officer that police should actually enforce road traffic law. Driving illegally is still seen as the prerogative of the driver rather than a crime. Even the outlier of drink driving is viewed as a personal matter: control should be exerted, but by personal friends only. Now, it may be that the winter 2017/2018 campaign has managed to stop some in the target audience from drink-driving, or letting their “mates” drink drive, although the effect of advertising and publicity is notoriously difficult to assess. My point is that we need to look at it both as an example of the lightning conductor effect, and as a public health message which situates it as a problem for the driver and his intimate friends. I suggest that if we are to properly situate rule and law breaking driving as the anti-social activity it is, our culture must produce very different messages in official campaigns against road danger. This entry was posted in News on February 6, 2018 by rdrf. It’s more than just ‘somewhat strange’ that the drinkers are being portrayed as the sensible ones, it’s actually quite perverse. The reductio ad absurdum, possibly for the follow-up campaign, is to let the designated motorist consume a full tray of drinks whereupon she suddenly develops the wherewithal to make the entire party cycle home! I guess this is the result of putting an advertising agency in charge of public information campaigns, hopelessly out of their depth without a product to sell, lacking (or very weak) oversight by an endemically clueless government department?